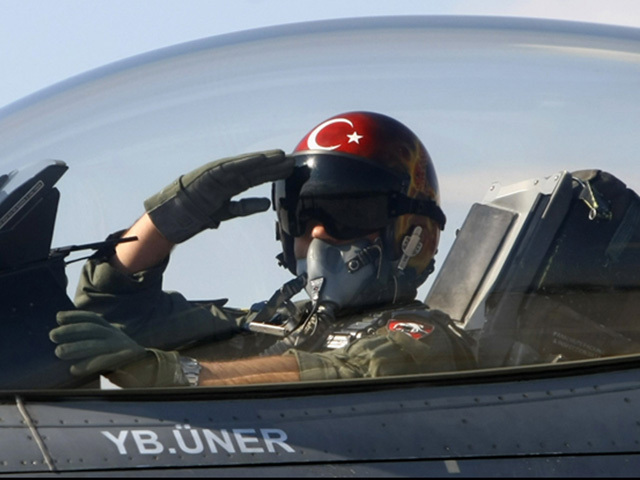 (AP) ANKARA, Turkey - Syria said Saturday it shot down a Turkish reconnaissance plane because the plane entered its airspace, insisting it was "not an attack" as both sides desperately tried to de-escalate the episode before it exploded into a regional conflagration. Turkey threatened to retaliate but did not say what action it would take as it searched for the aircraft's two missing pilots. The downed plane heightened tensions between two countries that had been allies before Syria's 15-month violent uprising, and signaled that the violence gripping Syria is increasingly bleeding outside its borders. Germany and Iraq were among the countries urging restraint in the region. Syria and neighboring Turkey had cultivated close ties before the Syrian revolt began in March 2011, but since then Turkey has become one of the strongest critics of Syria's regime. Turkey hosts civilian and military Syrian opposition groups, including hundreds of army defectors who are affiliated with the Free Syrian Army and collect food and other supplies to deliver to comrades on smuggling routes. Turkish authorities also suspect Damascus, which was collaborating with Turkey in its fight against autonomy-seeking Kurdish rebels, is now turning a blind eye to Syria-based Kurdish fighters who belong to the Kurdistan Workers' Party, or PKK, considered a terrorist organization in the U.S. and Europe. The plane, an unarmed F-4, went down in the Mediterranean Sea about eight miles (13 kilometers) from the Syrian town of Latakia, Turkey said. Syria claimed the jet violated its air space over territorial waters, penetrating about 1 kilometer (0.62 mile). It said Syrian forces only realized it was a Turkish jet after firing at it. In a telephone interview with Turkish TV news channel A Haber on Saturday, Syrian Foreign Ministry spokesman Jihad Makdissi said the downing was "not an attack." "An unidentified object entered our air space and unfortunately as a result it was brought down. It was understood only later that it was a Turkish plane," A Haber quoted Makdissi in a translation of the interview. "There was no hostile act against Turkey whatsoever. It was just an act of defense for our sovereignty." Turkish President Abdullah Gul conceded the plane may have unintentionally crossed into Syrian airspace, but said such an act was "routine" for jets to unintentionally cross borders for short periods. The government has not described the plane's specific mission. Gul said his government was still investigating what happened, but "no one should have any doubt that whatever (action) is necessary will be taken." It was not clear if that action would involve military retaliation, increased sanctions or other steps, including demands for compensation or an apology. Faruk Celik, the Turkish Labor and Social Security Minister, said his nation would retaliate "either in the diplomatic field or give other types of response." "Even if we assume that there was a violation of Syria's airspace  though the situation is still not clear  the Syrian response cannot be to bring down the plane," Celik told reporters. "The incident is unacceptable. Turkey cannot endure it in silence." "Our main concern is the spillover of the crisis into neighborhood countries. No country is immune from this spillover," said Iraq Foreign Minister Hoshyar Zebari. Turkey has joined the United States and other nations in saying that Syrian President Bashar Assad should step down because of the uprising in his country that has killed thousands of people. Turkey also has set up refugee camps on its border for more than 32,000 Syrians who have fled the fighting. Turkey said after an April border shooting incident  in which two people in a Turkish refugee camp died- that it would call on its NATO allies to intervene if it felt its security was being threatened. Turkish Foreign Minister Ahmet Davutoglu met with military officials Saturday to assess what steps to take and to coordinate the search and rescue operation for the two missing pilots and the plane's wreckage, the ministry said. Prime Minister Recep Tayyip Erdogan was expected to discuss the incident with Turkish opposition party leaders on Sunday, and the foreign minister would make a statement on the same day, an aide said. A Turkish official familiar with the meeting said Turkey was examining the plane's radar route and other flight data to ascertain whether the aircraft was flying over Syrian territory when it was shot down. The official spoke to The Associated Press on condition of anonymity because he was not authorized to brief journalists and would provide no further details. Turkey, which is uneasy about Greek Cypriot gas exploration efforts around the island, is believed to have increased patrols recently over the eastern Mediterranean. Some analysts have speculated that the plane may have been spying on possible PKK rebels near Turkey's border. U.S. Secretary of State Hillary Rodham Clinton earlier this month warned about a massing of Syrian forces near Aleppo, saying such a deployment could be a "red line" for Turkey "in terms of their strategic and national interests." In Baghdad, Zebari said Saturday that the recent defection of a Syrian pilot to Jordan and the downing of the Turkish jet showed that the Syrian conflict could have far-reaching repercussions. "If this conflict were to turn into all-out sectarian or civil war, Iraq would be affected, Lebanon would be affected, Jordan would not be immune, (and) Turkey could be (affected)." German Foreign Minister Guido Westerwelle said he was "greatly worried" by the incident, urged a thorough investigation and welcomed Turkey's cool-headed reaction in the immediate aftermath. U.N. Secretary-General Ban Ki-moon told Turkey Foreign Minister Ahmet Davutoglu in a telephone conversation Saturday that he was concerned about the implications of the incident for the region but commended Turkey for showing restraint in its reaction, said U.N. spokesman Martin Nesirky. Ban urged both sides to address the situation diplomatically, Nesirky said. Turkish Deputy Prime Minister Bulent Arinc and other government ministers urged restraint. "We must remain calm and collected," he said. "We must not give premium to any provocative speeches and acts." The leader of Turkey's main opposition party, Kemal Kilicdaroglu, said the downing of the plane was unacceptable, but he also urged calm. "All diplomatic channels must be kept open. We are expecting a coolheaded assessment of the incident," he said.